See Owen and Temesvary (2018) for discussion of data used in this graph. Why would gender diversity have an impact on bank performance? There are two broad explanations for how gender diversity would affect a company’s economic performance. The first is that women are more likely to contribute specialized expertise in certain areas. As a result, when there are more women on the board, there is a higher chance that the board has those characteristics. For example, Kim and Starks (2016) argue that women are more likely to have different functional expertise than men (e.g., human resource experience or a background in government) – so adding women to a board may increase the heterogeneity of board expertise and improve decision-making. Adams and Ferreira (2009) take a different approach with this line of thinking and show that female board members have better attendance records at board meetings than their male counterparts. They argue that this makes female board members, and so boards with more women, better monitors of senior management. The second broad explanation of why gender diversity matters is that it is diversity itself that has an impact. Previous work has shown that diversity has both costs (conflict and coordination issues) and benefits (multiple perspectives leading to better decisions). In other contexts, Alesina and La Ferrara (2005) have shown that increased diversity is associated with greater creativity and productivity, provided that the institutional context in which the diversity occurs minimizes any conflict associated with it. Our results are in line with this second explanation because we show that the positive benefits of diversity only occur at the better managed banks. Our approach to finding evidence for these somewhat complex relationships relies on testing two hypotheses. The first hypothesis is that the performance impact of gender diversity depends on its existing level. We test this by including in our regressions the squared term of gender diversity in addition to its level. This hypothesis is motivated by previous work which has shown that the gender composition of the group influences the behavior of women in leadership positions. For example, Karpowitz and Mendelberg (2014) document that women speak more frequently when the percentage of women in the group they participate in increases. Thus, it is possible that a positive impact of increasing gender diversity only occurs after a threshold share of women is on the board—especially if the benefits of diverse viewpoints are not fully realized unless those viewpoints can be expressed with authority. 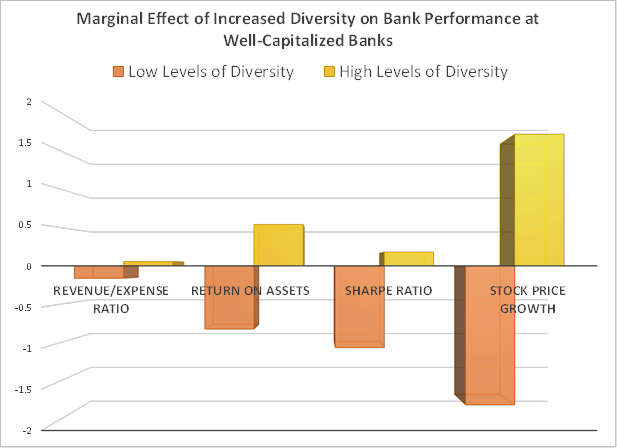 The second hypothesis is that the impact of diversity depends on the quality of bank management. We test this hypothesis by examining the impact of diversity across banks with higher and lower levels of the risk-weighted capital ratio, which we use as a proxy for the quality of bank management. (Other researchers have correlated the risk-weighted capital ratio with the quality of bank management.) This hypothesis is based on the broad idea from existing literature that institutional context affects the impact of diversity; better managed firms can minimize the potential conflict that can accompany diversity and can therefore better reap its benefits. Our overall approach is to estimate instrumental variables regressions on annual data from 87 U.S. bank holding companies over the 1999-2015 time period. In order to avoid inappropriately attributing to gender diversity an effect that should be attributed to something that is correlated with gender diversity, we include several control variables in our estimations. We include board characteristics that might be correlated with the gender of board members (e.g., age, number of boards served on, wealth of board members) as well as other bank characteristics that might also affect performance (e.g., loan to deposit ratio, the size of the board, or if the bank made an acquisition in a specific year). Our estimation strategy also includes bank and year fixed effects. 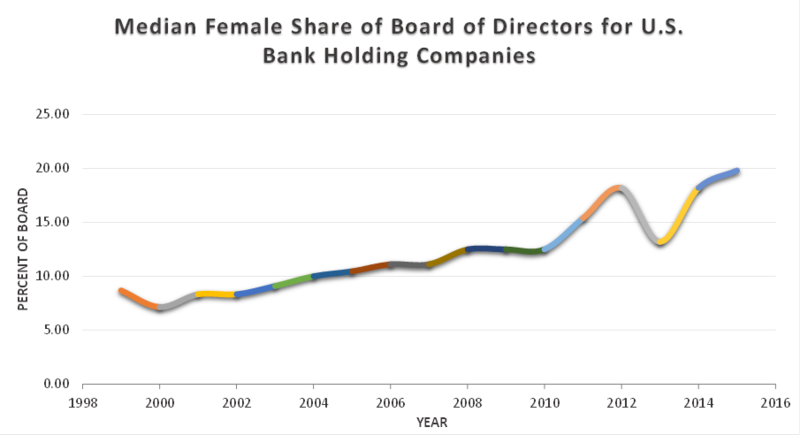 It is also possible that the causation runs from bank performance to gender diversity of the board, especially if poor performance causes a board shakeup or better managed banks seek board diversity. The instrumental variables techniques addresses that issue by using the share of independent directors and the initial gender diversity of the board times year fixed effects as instruments. This estimation strategy allows us to interpret our results as implying that gender diversity has a causal role in explaining bank performance. Our main results show evidence for both of these hypotheses. We find that more gender diversity has a positive impact on various measures of performance (revenue/expense ratio, return on assets, Sharpe Ratio, Stock Price growth) once a threshold level of diversity is achieved (confirming our first hypothesis) – while diversity has a negative impact on these same performance measures when its level is low. Furthermore, we also find that the performance benefits of gender diversity accrue only at well-managed (capitalized) banks (confirming our second hypothesis). This chart shows the point estimates of the marginal effect of a one standard deviation increase in gender diversity on bank board of directors on various measures of bank performance for banks with high and low levels of gender diversity. The marginal effects are divided by the median level of each performance measure for comparison purposes. See Owen and Temesvary (2018) for a detailed explanation of these calculations. To gain better insight into the ways in which gender diversity may impact bank performance, we examined how well gender diverse boards performed two important functions: 1) monitoring and 2) providing strategic advice. To explore how gender diversity affects monitoring, we estimated the impact of greater gender diversity on the number of enforcement actions which regulators impose on a bank. We found that more gender diverse boards were associated with a lower probability of regulators taking actions against the bank holding company – in particular, enforcement actions related to the financial health of the institution were reduced. 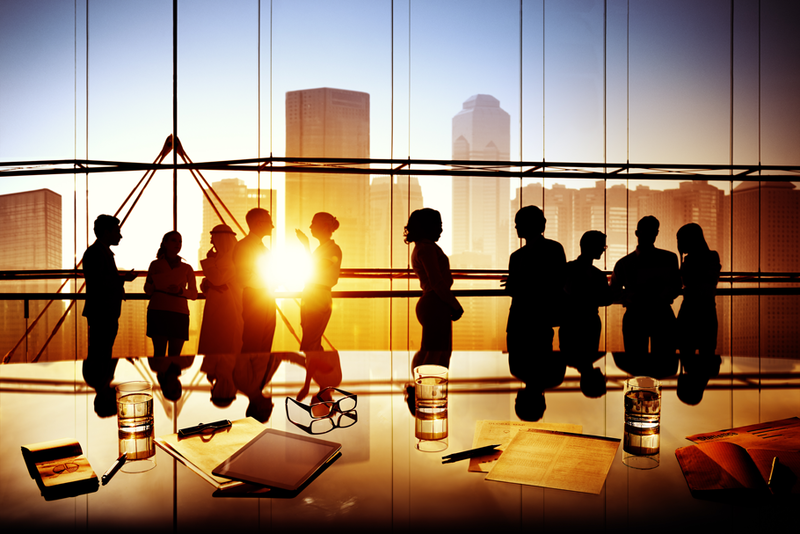 These results suggest that gender diverse boards provide better oversight of management. We also examined how the impact of gender diversity on bank boards changed during the financial crisis on the idea that good strategic advice would be especially impactful during times of crisis. We found that the performance effects of gender diversity were larger during the financial crisis. Taken together, the evidence regarding fewer enforcement actions when bank boards have more gender diversity and the indication that the impact during the financial crisis was larger are suggestive that more gender diverse boards are better monitors and also provide better strategic advice. There are three important conclusions from our work. First, context matters. When studying interactions between people with different characteristics, the context in which those interactions occur is relevant. 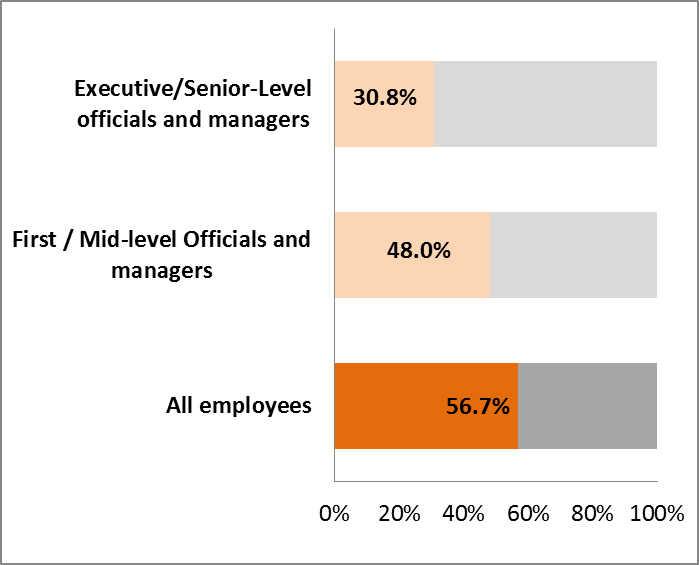 In this case, we show that both the quality of bank management and the existing level of gender diversity have an important impact on the functioning of a diverse board. Second, because context matters, our work can help to reconcile conflicting results on this issue from the existing literature. Finally, an important policy implication is that continued voluntary expansion of gender diversity on bank board of directors is likely to bring overall performance benefits, provided that the bank is well managed. Ann Owen is a Professor of Economics at Hamilton College in Clinton, New York and Judit Temesvary is a Senior Economist at the Federal Reserve Board of Governors in Washington, D.C. If you want truly useful diversity, don’t allow it to become a race or gender issue.